Does it happen to you that when you enter in business networking event you started to feel nervous and sweaty palm? All your confidence, charm and communication skills flew out of the window? Then you should learn the art of networking. The art networking comes very easy to us, we start networking even before we understand what we are doing but when it comes to the business world, the art of networking become necessary because business networking is different from your day to day networking you do in your everyday life. 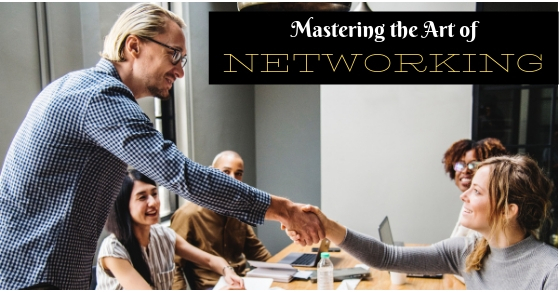 In business you need to master the simple and effective way of networking; it is important for your professional growth to learn the art of network. The art of networking is as natural as breathing like when you move houses or town you converse with other people to help you in general necessities of life, the same thing happens in business networking. It is as natural as moving to another town but few of us face difficulties when it comes to business networking and networking events simply because this networking affect our career, business growth and our status in the business world. So many people try very hard to build business networking but you can master the art of networking in the most simple way. You don’t have to try very hard to learn the art of networking, it is an art; a way to share information and gain knowledge in most effective manners. Take it easy and you will be the master of networking, just follow these simple ways to learn the art of networking and see the magic of it. You are thinking what I am going to do in a bar, I don’t drink but the bar is not only for drinking purpose. Bars are the great networking field; you can create some valuable networks in the local bar of your area. You do not need to drink for networking, you can strike conversation by just positioning few steps from the bar and drink in your hand. Bars serves as great networking opportunities for a newbie as they know very few people. Networking events are a great platform for creating a meaningful network for your business but you do not want someone to start with you on the basis of a lie. So be yourself and don’t try and pretend to be someone else as it going to help you in building long lasting business relations and will help you in the long run also your clean image is going to attract more rather than your fake one. If you are expecting something extraordinary or out of the box in a networking event then you are setting yourself for the disappointment because there is nothing out of the box in a networking event. Set reasonable expectations and know why you are here; to know about the new organization? To meet new people from your industry? Interact with someone particular in the event? Or to spread your network among other groups? It is better to expect something reasonable and do some pre-planning for it. You do not need to be there half an hour early but few minutes before event start can work in your favor. When you enter in business event late, you have to push your way inside to start communication as everyone already engaged in conversations but when you come few minutes earlier than everyone else then people start a conversation with you to engage themselves. So be few minutes early to the networking event. What better way to start a conversation than asking some meaningful and powerful question? There are so many people already conversing, why is anyone going to start conversing with you? To start a good conversation in business networking event ask powerful questions as who don’t want to praise themselves and people always remember good listener. Asking meaningful questions also shines your image in the group and make you highlight and you receive desirable attention. Taking notes doesn’t mean to start writing in your notepad in networking event but to make notes in your mind, also write about the card owner behind the card after they leave you after giving their card or as soon as you got opportunity without making it obvious, that way you will remember them more specifically and your mind will pick up information instantly later on when you rechecking the card. Pay attention and make a mental note if you get something useful; you can even write a small message on your phone. You must introduce yourself to the owner of the event that way you will have more information about the event and who are involved in it, even you get more opportunity to engage in meaningful conversation when you seek out the owner of the organization. Introducing yourself to the organizer also helps to promote your interest in the event and it works in your favor for long terms. People who organize event have important contact and getting on their good terms will help you. Do not try very hard; the friendly approach is what you need. You go to business events to spread your business network or to make new contacts and when you are trying to build something you need to be polite, humble and approachable. The friendly approach also helps you in maintaining contacts and spreading your business network, it also shows that you are really interested and want to be associated with them on the other hand rude behavior or arrogance works like your enemy. When you have a conversation with other business associates don’t throw your business card without inquiry or interest from another person. It often happens when we go to business events and try to spread our business network we think by giving your card to anyone and everyone helps in creating a wide network but this is not true. First get the interest of other party and know the nature of their business only then offer your business card to them. It also shows that you refer yourself in high regards. Listening carefully is one of the traits going to help you in not just networking but in other areas of business as well. How you show another person that you are really interested and want to communicate to them? By listening them. Simply when you listen to someone carefully and give them your whole attention it makes them feel important and that you really interested in what they are saying. When they feel important they give importance to you as well, so listen carefully. Words hold so many powers in themselves that right and meaningful words can leave a very lasting effect on the person you are talking to so always try to start a conversation with something which holds importance to them as well as you. You can start the conversation by asking about their interest in business and why they chose a particular field; ask about their area of expertise and kind of business they want to start or to work. Understand the importance of conversation and meaningful words in business networking, it will help you as long as you will work. Do you think talking to as many business associates as possible is going to help you? Then think again because its going to work against you. When you try to talk with so many people in a limited period of time, your mind becomes hyperactive and you cannot keep the single conversation in your mind for long, even it affects the quality of conversation because you are unable to pay attention to one person properly. Pay attention and talk to a person related to your business or you think are good for business and pay attention to them not the number of candidates you converse with. Have you heard that sharing information helps in gaining more information? Well, it suits business networking perfectly; when you help someone by sharing something useful with others they think of helping you and will remember you for a long time. Sometimes you help someone related to other fields by sharing what you know and in return, they help you by providing useful contacts. But remember, don’t expect every time you share something because it will look like you are using them for your own benefit. Don’t try to have a lengthy conversation instead, focus on the quality of conversation. Because at the end of the day what matters the most is the quality of your conversation you have not the quantity because long conversation without something meaningful is just waste of your important time. Quality over quantity also helps you in other areas of your business and increases your brand value in your business network because everyone wants to have a conversation which is productive rather than wastage of time. To the point, questions and answers help you in gaining more attention and exposure in the business networking because you don’t have the whole day to chit chat and the person you are conversing have other important stuff to do. So keep your question and answers specific and to the point, do not add or ask unnecessary information because it may look bad on your part as well as others may lose their interest in a conversation with you. Sometimes a wrong question or word makes the whole conversation awkward and uncomfortable so avoid these kinds of words and questions. Don’t think lowly of yourself or don’t spread yourself so thin that people forget you, the instance you leave their side. Increase your value means to add value to your words, show your confidence but do not overdo it, also introduce potential business associates to each other as it will increase your value and your image in another mind. When you try and serve others whenever it seems possible you don’t come off as pushy or desperate for a selfish reason. People acknowledge those persons more who hold themselves in high regards but approachable. Always leave the conversation on pleasantry note. Do not just wander off in the middle of a conversation or ignore while someone saying anything in the group you are standing and associating because it makes them notice you but for entirely wrong reasons. When you leave the conversation or the group where someone is saying something then politely excuse yourself with good enough reason so that your leaving looks natural rather than disrespect. It also shows your fine etiquette when you leave the conversation on pleasanter note. The key to success in anything you do is to stay in your comfort zone and do things which are related to you. A simple way to learn the art of networking is to keep it simple and just relax. Don’t make it complicated and just be comfortable in your skin. Try to converse with people and you will contact with the right people. Relax and don’t jump to the conclusion about anyone because you are here to gain. Try these steps and you will rock your networking events. But always keep your toes to the floor and keep your confidence in check as it may affect you image and appearance and we don’t want that to happen. Keep your mind alert and concise when you listen to others and pay your full attention to what others are saying. Another way to keep you on the top of the game is to observe others and make note of the positive things about them and try to learn from successful business network groups and people in the group. Next articleHow to Prepare for a Layoff Before It Happens?